There’s a wonderful old story about a man and a woman, out for a Sunday driver. “Oh, look, ” says the woman, “there’s a Dairy Queen.” My husband and I endlessly live this story. For he, like the man n the story, would nod and drive on. And, like the woman, I would be annoyed. Why didn’t he stop so we could get a refreshing ice cream? The point is not to complain about my marriage, which on the whole is pretty good. Except we definitely speak different languages, and words often have dissimilar meanings to each of us. The point is to remind ourselves that what we think we are saying and what someone else is hearing, very likely are two entirely different things. This is important to those of us who make our living communicating–or trying to. And just as it is true that one size does not fit all, it is critical to remember that one appeal or case, a single story, one so-called elevator speech, will not send the same message to every single constituent. You must personalize, especially when you are attempting to raise larger gifts or get someone interested in a new initiative. And personalizing means conversation. And true conversation does not speak in shorthand. That, I think, is the true meaning of the old story I began with–and with too many interactions my husband and I have, typically about food. Knowing what we mean, we don’t bother to explain to the other. I point out the dairy queen, knowing I want a cone; he hears me and yet doesn’t. Most likely, at that moment, he’s not thinking about ice cream, but rather about the jerk in the lane ahead or some such. Perhaps a husband should—but your donor? I don’t think so. It is our job to make sure that they know what our needs our and, even more importantly, that they are given the chance to tell us about theirs. The smart fundraiser will then connect the two together. I remember an old boss who complained after a visit by a major donor prospect that he (my boss) had spent two hours with the prospect, showing him our plans for a new lab—and the prospect simply noted that it looked “terrific” and was “very impressive.” He didn’t, however, offer to fund it. “Did you ask him?” I said. “Well why did he think I invited him here?” my boss countered. But it wasn’t the prospects job to uncover reasons—it was my boss’s job to be clear. My boss needed to tell the prospect what the project would cost, and to ask if this would be something of interest for him to fund. By not clearly explaining what you want, you run the real and very probable risk of not getting it. You may find, most likely will find, that your prospects, like the man in the story or my husband, will drive right on by the very place where you really wanted to stop. 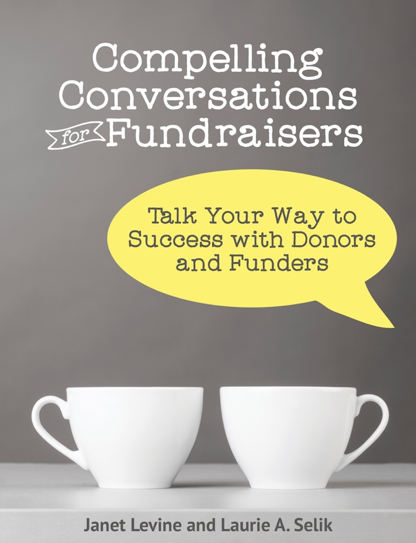 Janet Levine works with nonprofits and educational organizations, helping them to increase their fundraising capacity. Learn more at http://janetlevineconsulting. While there, sign up for the free newsletter. This entry was posted in communication and tagged Ask, communications, fundraising, hearing, listening, need, relationships, solicitations. Bookmark the permalink.